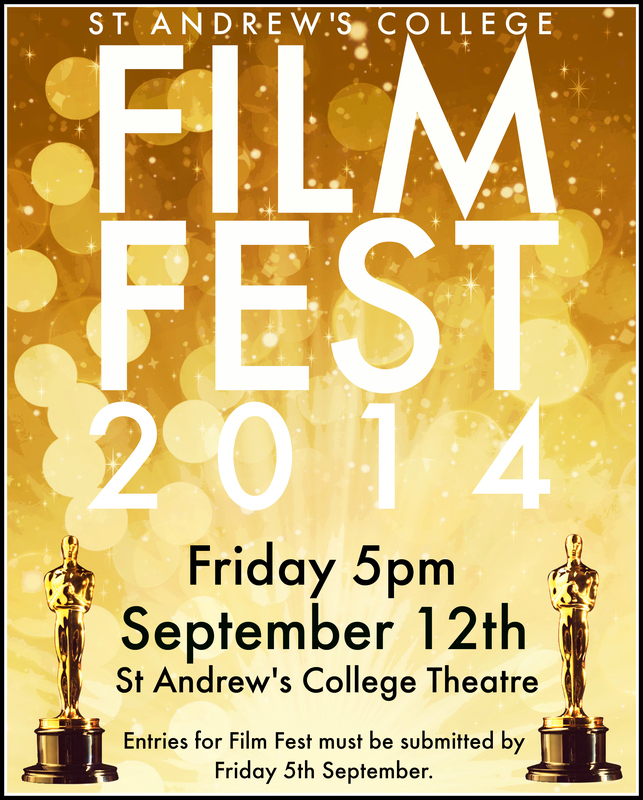 Each year since 2009 St Andrew’s College has run a Film Festival – an evening dedicated to celebrating the diverse creative talents of our students and their film making ability. Originally accepting all student film submissions, over the years the event has been refined to a showcase of the top ten student entries, interspersed with a number of “5 second films” which are usually humorous in nature. When I met with the Media Studies team to find out more about this festival, I learnt that it was originally a student initiative as they looked for an opportunity to showcase and celebrate their work, and this was supported by head of Media Studies, Mr Simon Williams (whose TV & Film events I’ve blogged about before). It has subsequently evolved to include a red carpet style experience, with the Cultural Captains functioning as the presenters / MCs for the event, whilst other students involved interview attendees as they arrive, with these being broadcast live through to those already in the Theatre. Along with these interviews, there is an invitation for all attending to dress up and make a night of it, which all contributes to the special feeling of this occasion. The Film Festival celebrates student creativity and is intended to be an inclusive event for a wide audience range with the expectation that all films can be viewed by the students’ younger siblings and grandparents. This helps ensure the themes and content remain in good taste with films vetted for unsuitable content. Consequently, a good size crowd comes along for an enjoyable evening and it is seen as a chance to appreciate these films quite apart from the assessment criteria upon which they are usually judged. Additionally, part of the success of this evening is the length – it’s usually all over in an hour. People all love movies – you can’t go wrong with a film festival! It’s a chance to promote our creativity, a payoff for our hard work. It’s nice to premiere our films in front of our family and friends – seeing the films on a big screen, with big sound and a real audience is awesome. From a teacher’s perspective, showcasing the films in this way adds a sense of gravity to the production of them – if over a hundred strangers are going to watch your film, you’re going to try that little bit extra. The majority of entries come from students involved in the Media Studies and TV classes and typically represents the culmination of nearly two terms worth of effort. Students may spend up to twenty hours in the filming production, combined with up to thirty hours of post-production editing. This editing is done on a range of devices, with some students preferring to use their own laptops, often MacBook Pros using Apple Final Cut Pro, whereas others use the College computers and Adobe Premiere Pro. Support is also available from staff member Mr David Jensen (who filmed our Mystery Skype Session with Singapore), who has worked on a number of feature length and short films including Netherwood, as well as the other Media Studies teachers. On the night the Cultural Captains have significant responsibilities: from welcoming the guests, to MC’ing the event, introducing each nominated film and interacting with the audience. They come up with their own monologue, often putting significant effort into this. Behind the scenes there is a technical crew of up to twenty students and staff that ensures the event runs smoothly – this involves organising the lighting and making sure the films, often submitted in a diverse range of digital formats, all play successfully on the night. This team is co-ordinated by Mr Williams who continues to play a key part in the ongoing organisation and success of this event. These awards are not the focus of the evening, but add to the sense of a film premiere that the students have worked towards creating. The titles of the nominated films are announced in advance, with a promotion in a full school assembly to build anticipation for the event. Media Studies teachers meet a week before to judge the films and agree on the prize winners. Many of the students involved in the Film Festival are regularly volunteering their time in other College events, providing technical sound and lighting expertise for assemblies and the massive event of our annual prize giving. I also love the fact that this festival provides an opportunity for the wider community to come share and celebrate in the success of our students’ work. The evening is seen as a chance for students to celebrate their shared passion for film and media and for all these reasons, it is a very popular event on school calendar.